Four Winds Festival, Bermagui, NSW, Australia. Featuring some of the best musicians from around the world, enjoy relaxing days of beautiful repertoire in glorious surroundings. 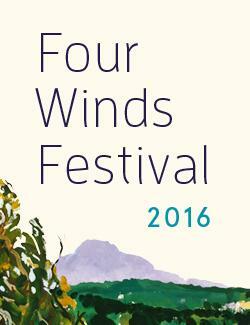 Four Winds Festival is held every second year to celebrate classical music in the beauty of the Far South Coast of NSW. The Festival features premieres of new works and collaborations you won't hear anywhere else. Click "Select from another date" to go back to the first screen and look at the venue options again. Am I eligible for a concession tickets? Seniors cards do not apply. To purchase a concession ticket you must hold an Australian Pension Card, Centrelink Health Care Card, Department of Veterans Affairs Gold Card or a Full Time Student Card. The Four Winds adventure starts on the bus. They're FREE and you can catch yours along four different routes. NEW Car park tickets must be purchased for Saturday and Sunday during the day. You can buy yours online and collect them from the Festival Office (3-5 Bunga St). NEW Festival programs are available to purchase from the Festival Office, 3-5 Bunga St, Bermagui, as well as at the event.